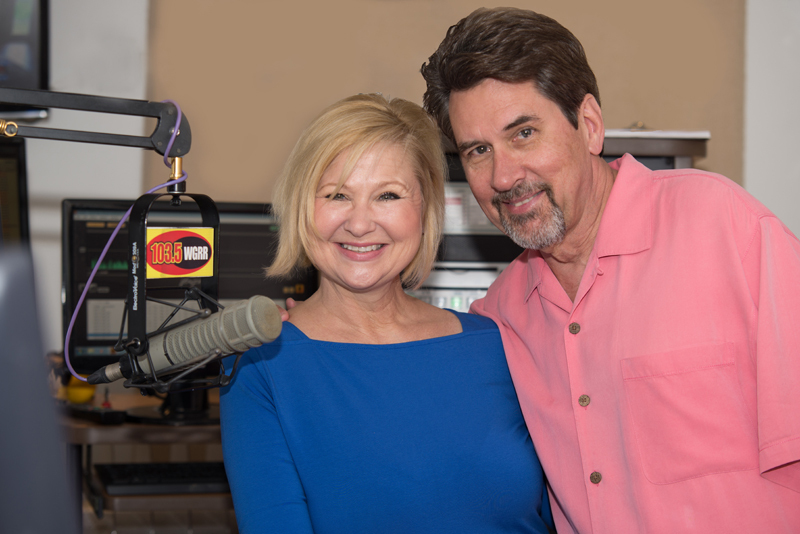 The 103.5 WGRR “Married with Microphones” morning team of Chris O’Brien and Janeen Coyle have been married for 32 years, and have worked together in some capacity for longer than that! Chris & Janeen met while both worked at the same Cincinnati radio station in 1979. Chris began in radio while a teen in his native South Carolina (Go Gamecocks! ), working in the south before being offered a job in Cleveland while in Chattanooga, Tennessee. Chris moved from Cleveland to Cincinnati in 1974. Except for doing afternoons at WMET Chicago 1977-78, Chris was with WKRQ for nearly 13 years. He has been named Best Radio Voice by Cincinnati Magazine and a Billboard Personality of the Year nominee. Chris joined WGRR in 1991. (Little known fact: Chris was the first announcer for the Jerry Springer Show when it began – yikes!) Chris is also an honorary Kentucky Colonel, son! Janeen joined WKRQ in 1979 while attending the University of Cincinnati’s College Conservatory Of Music. She began with overnights, worked middays, and later moved to afternoon drive where she remained until 1988. From there Janeen did talk radio, hosting the very popular Chick Talk show. Janeen co-hosted morning drive with on WKRC until she was contacted about joining Chris in 1995 and forming the unique husband & wife team. The two even did a daily live morning “watercooler” segment, simulcast on WCPO-TV for several years. Chris & Janeen are very involved in the community, appearing at fundraising events and supporting the Arthritis Foundation, SPCA, Diabetes Association, Breast Cancer Awareness, Ronald McDonald House Charities, Cincinnati Association for the Blind, School for the Creative and Performing Arts, Cincinnati Arts Accociation and Kindervelt, among others in the tri-state area.